I have always hated lugging big, bulky, heavy garden hoses across the yard when watering the trees or garden, or taking water to the animals. This Ohuhu 50 Ft Expandable Garden Hose with 8-pattern Spray Nozzle and Copper-coated Aluminium Connectors eliminates much of the work involved in performing these tasks. I love that this 50 foot garden hose weighs only 2 pounds, yet is strong enough to hold up to every task I need it for. 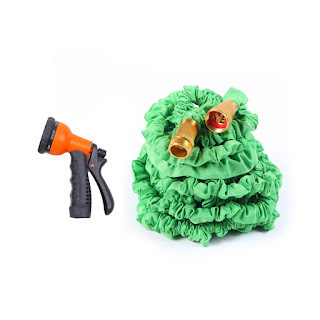 The expandable hose takes up very little space for storage, and is easy to roll up and hang on a hook when not in use. I have had no problems with this hose getting tangled, and it doesn't get kinked up like old fashioned garden hoses often do. The sprayer that comes with this is really nice too. It has 8 adjustable patterns and copper-coated aluminum connectors. It is easy to adjust to whichever spray you prefer. I have only tested this product for a short time, and only within greenhouse conditions so far since winter in Michigan isn't exactly the best time to be out spraying any hose around my garden, but from what I have seen so far I really like this hose and would recommend it to others. If my views change with further use I will update accordingly.